Portisch and Spassky are two very special individuals in the world of chess. Spassky, like Bronstein, belongs to the "Romantic" type of player. If I remember correctly, one of his first trainers, Tolush, used to tell Spassky not to show him any game that did NOT contain a combination. Maybe because of this, Spassky became a world-class middlegame player. According to Spassky himself, his strength was that he could play the middlegame better than most of the players of his time. Spassky, along with Bronstein, was one of the few players who dared to play the King's Gambit at the highest level! In 1960 he defeated BOTH Fischer and Bronstein with the King's Gambit! To highlight this aspect of Spassky's play, I will give both games with comments. Looking for any publication of the following game with comments, I was surprised to see it was NOT in Kasparov's volume on Spassky ("My Great Predecessors, Vol. III"). The ONLY place I found it with comments was in "My 60 Memorable Games", by Bobby Fischer. These two games give us a glimpse into Spassky, a player of colossal talent and world-class sportsmanship. Spassky is an elegant, cultured man, and this alone makes him stand against the brute force of the Soviet regime. I remember reading that Spassky declared that his years as World Champion were the worst of his life. This surprised me! Why? Because usually the fulfillment of a life-long dream is supposed to bring happiness! After all, being declared "World Champion" proves one's "superiority" over his rivals.....being seen as "first among best" should fill the human ego with pride, no? Spassky's idol, mentor and model was Paul Keres, who was also a man of great class and elegance. Paul Keres, by the way, should have become World Champion, but among the many reasons he did not was the hands of the KGB and Kremlin manipulating results so Smyslov would be the official winner of the 1953 Candidates' Tournament! If this sounds too machiavelic to be true, please read Bronstein's book, "Secret Notes", to get a bit of an insider's view....I will publish a separate blog about Bronstein's struggles later. Now let us see a game which gives us a glimpse of Portisch! In his book "Black is Back! ", Andras Adorjan pays tribute to many of his peers from Hungary; many of them GMs of great class! We played our first (serious) game in 1968- an Evans Gambit ending in a draw. Our balance became somewhat shady for me. We became friends, which is nice and strange. You couldn't find two persons in the whole world being so different. Mutual respect did it all. He's a great man. When he was 50 he suddenly started singing. He is a bass-baritone, and dead serious in everything he does. Indeed he reached a certain level, and he has a repertoire close to Placido Domingo's. He has given many concerts. Frankly speaking, it's easier to respect him than to love him, but I have friendly emotions toward him, and in a peculiar way he returns them. We are both idealists, that is the point." Portisch also played a few great games against Vassily Smyslov! In the following game, played in the 1978 European Club Championship, Portisch plays the Indo-Benoni against Smyslov, and proceeds to outplay him! Now, in the 60's, Spassky defeated Geller in a Candidates' Match by playing the Closed Sicilian as White. Even though Spassky played inaccurately, the fact that he was attacking Geller's King was decisive! Spassky's second, Bondarevsky, had correctly understood that Geller felt uncomfortable when his King was attacked! 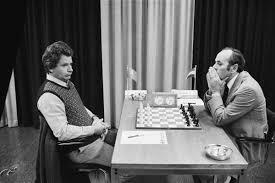 In 1977, Spassky played the Closed Sicilian against Portisch in their Semi-Final Cadidates' Match...and won! However, in 1980, in their Quarter-Final Candidates' Match, when Spassky tried the Closed Sicilian again, Portisch was ready! What worked against Geller failed against Portisch....psychology does work, but the objective truth of the position sometimes prevails!